The last time I talked about health care economics was a mere couple weeks into the lifespan of this blog. In that post, I noticed that Medicare’s costs, while increasing, have increased at a much slower pace than private insurance costs in the United States. Then, today, I ran across this study from Leighton Ku and Matthew Broaddus and learned that it’s not Medicare that should serve as the poster boy of the potential benefits of a “government takeover of healthcare”, it’s Medicaid and SCHIP. Let me show you. So if you are an American adult on private insurance, you are, on average, paying around 600% more out of pocket than you would if you were on Medicaid, and if you have a kid, it’s over 700%. A government takeover of health care could save you 85% or more on health insurance. GEICO, eat your heart out. Of course, the 85% is merely the out of pocket cost saving–the state would have to get the money to pay the insurance cost through taxation. Despite this, the total healthcare expenditure still falls by around 20% for adults and 26% for kids. It’s still better than what GEICO promises motorists, and again, this is the average–if we assume the tax the state would use to fund an expansion of Medicaid to be progressive, people further down the income scale would save considerably more even when their taxes are taken into account. They have tremendous bargaining power relative to Medicare or private insurance companies because they are bigger than private insurance companies and have been given more legal authority to bargain than Medicare. They can say no to treatments that fail a cost-benefit analysis–the dreaded “death panels”. If I may make a brief point about “death panels”–anyone who thinks about cost-benefit analysis for more than five seconds can see that it’s an essential feature of any rational health system. If a pill costs $1 billion and will only save 2 lives per year, it’s not something an insurance company, whether private or publicly run, should be willing to pay for, because it robs the rest of the health care system (and the wider economy) of a huge pile of money. When you spend a disproportionate amount of finances on a small number of patients, you rob the research and development that would lead to cheaper cures that save more lives. The proper response to scaremongering about death panels is not “there are no death panels” but “yes, there are death panels, but they’re great, and here’s why”. If you take 20% off of the American figure, we’re down to $6589 per citizen per year. We would still have the highest per capita health care costs, but the gap would be smaller, and that would be a nice start. 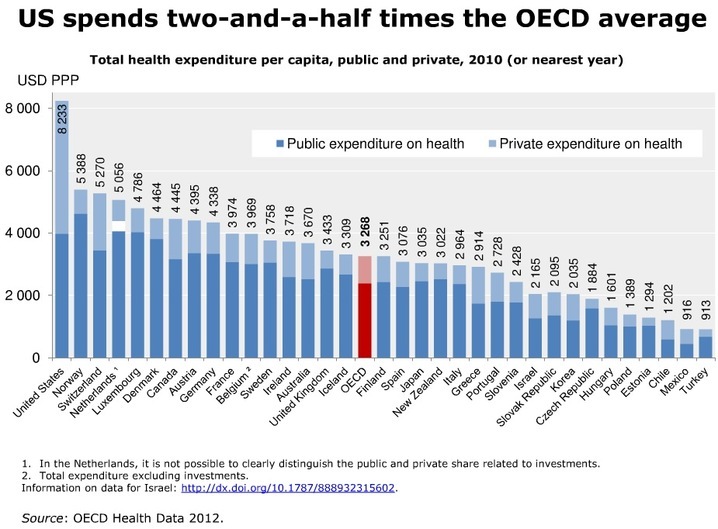 If we really wanted to make a play for a shedding our “most expensive health system” label, we would need to embrace a comprehensive single payer system like the one in Japan, which, in addition to being second cheapest on our list next to only Italy’s, also provides its citizens with a full five years of additional life expectancy over and above America’s own. All of this assumes, of course, that Medicaid remains Medicaid and that we do not have Medicaid buy private health insurance. Why on earth would we have Medicaid buy private health insurance when it can insure people for less money than the private companies can? There’s no justification that makes any sense to me, but believe it or not, some state governments run by republicans actually do this, effectively giving taxpayer money away to private insurance companies as corporate welfare. The sad thing is that we had an opportunity to move in this direction with the public option in 2010 yet failed to do it, and that was with a democratic house and 59 democratic senators. The chance of any progress being made on this issue at the federal level going forward is pretty much nil, so unless you and I manage to be poor enough to qualify for Medicaid or SCHIP, we will continue to spend 2.7 times more per capita than the Japanese do on a healthcare system that will kill us 5 years faster on average. It doesn’t make any sense, but since when have our voters desired policies that made sense? Excellent post. I really enjoy your blog, its a lot more detailed and thought out than most. Its one of the great paradoxes that America simultaneously has the most expensive and least efficient healthcare system. Your right that Obama missed a golden opportunity by not pushing for a public option in 2010. It’ll be a long time before an option like that comes around again. Thank you, I’m so glad to hear this piece, and the blog as a whole, is enjoyed. I imagine that at the very least, comprehensive health care reform won’t come up again until the last of Obamacare’s changes come into effect in 2015. It is a pity, especially considering that health care is the most significant contributor to long-term deficit worries. Interesting post, I just wish it had evaluated all the facts. It started me wondering, is the government really more efficient in this one area when it fails in the others? It certainly is if you don’t consider all the costs! Medicaid has a fraud rate of at least 8% (lowest estimate, most between 10-20%) compared to less than 1% in private insurance. Unlike private insurance companies that include their audit, investigation costs, etc in their costs, the costs above don’t include the costs of the CBO and GAO in overseeing Medicare, nor do they include the cost of the FBI in pursuing fraud or the IRS in collecting the taxes that fund these programs. When the program expands, these costs expand at least linearly (and sometimes exponentially) Once these are taken into account, it’s staggering how expensive and inefficient the program is.